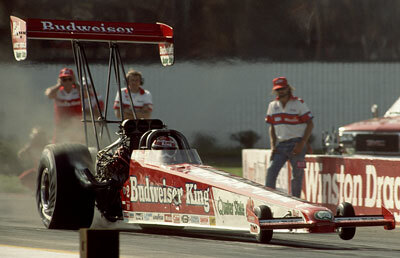 The 1992 Gatornationals were a turning point in the evolution of the Top Fuel dragster that changed the sport forever. 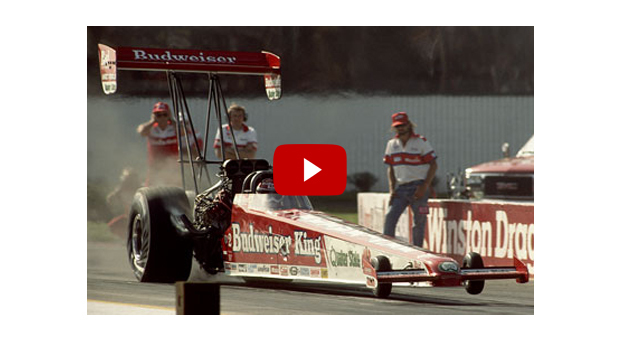 The advent of the 300-mph era began when Kenny Bernstein and his Budweiser King Top Fuel dragster eclipsed the barrier at 301.70 mph. That Friday’s qualifying run rocked the drag racing world. 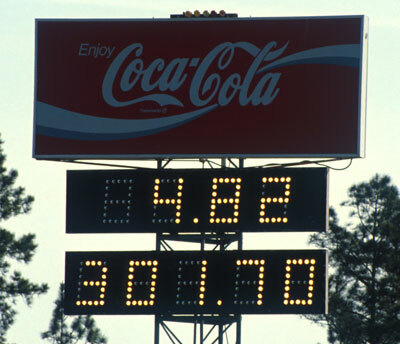 In that year, the anticipation of the Florida spring race built additional spirit with the four-second barrier down, the 290 mph speed broken and, in Top Fuel, only one horizon remaining to be reached. Slick 50 engine treatment manufactured by Quaker State had put up $50,000 to the first driver who could achieve the magic 300-mile per hour record as well as sponsor of the Slick 50 300-mph club. Looking back, Joe Amato had broken the 260 and 280 speed marks and Connie Kalitta surpassed the 290 mph zone. On March 20, 1992 at 4:44 p.m. Bernstein, being the second pair by his crew’s choice, was alongside Al Segrini. Both left the starting line and after Segrini smoked his tires, the rest of the track belonged strictly to Bernstein. He claimed the title of the ‘The King of Speed’ with a time of 4.823 seconds at a then mind-blowing speed of 301.70 mph. At first in the shutdown area, Bernstein was concerned because he felt the engine flatten out 200 feet before the quarter-mile finish line and was concerned, but pushed through it in hopes breaking the record. As he was coasting to the turn off, one of the track workers was holding up three fingers and Bernstein’s first thought was that he was the No. 3 qualifier, not having any idea that he had broken the barrier. There wasn’t any Steve Evans of Diamond P sports at the far end to tell the drivers what they had run, because most production people had left early to get ready for the Don Garlits Hall-of-Fame dinner in town that was later that evening. So, only one TV crew from a local ABC affiliate in Gainesville had any footage of the run and had the scoop. In the press box, even Bernstein’s PR representative, Susie Arnold, was nervously so into the run that she was writing down the elapsed time not noticing the speed while everyone in the media was screaming ‘Look, KB, just ran 300!’ She looked up and paused for a moment shaking her head not believing it herself. “The car left good and was running hard in the middle of the track, but the engine got a little sour right in the lights,” said Bernstein. “Normally, I would have lifted, but I told myself to drive it all the way out the back door because it might be the run. I didn’t care if it dropped cylinders or not. I knew I was going pretty fast because I had to drive farther than I normally do to make the turnoff. As the weekend progressed, Bernstein did establish 301.70 mph as the NHRA National event Speed Record along with the $50,000 prize when he backed it with a run of 299 in the quarterfinals against Tommy Johnson, Junior. Crew chief, Dale Armstrong and alongside him, Wes Cerney, had been working diligently improving the cylinder heads to increase and expand the air flow and had discovered a working combination. As far as records go, Bernstein wasn’t the only one setting new marks that weekend. The Texan, Eddie ‘The Thrill’ Hill left the event with an additional 200 points setting the NHRA National Elapsed Time record of 4.80 in the quarterfinals against then driver, Kim LaHaie. He drove his ‘Nuclear Banana’ into the finals up against Bernstein setting the matchup between the fastest and the quickest men in drag racing. 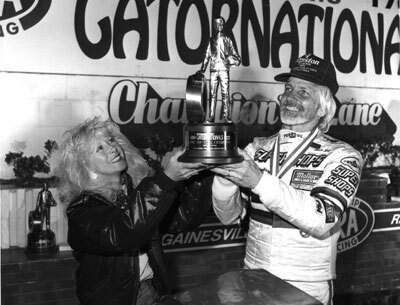 In the Top Fuel finals when the green flashed, Bernstein immediately lost traction sending Hill onto victory with a time 4.84 seconds leaving the Gatornationals with the coveted Wally and the sport has never looked back. John Force beat Jim Epler in Funny Car and Warren Johnson defeated Eckman in Pro Stock in the other professional classes.